Most people associate theme park food with three words: Quick. Greasy. Fried. In today’s post, though, we’re going to talk about a few full-service Orlando theme park restaurants that blow those pre-conceptions out of the water. Bon appetit! This popular addition to Fantasyland is easily one of the toughest tables in the city, often booked up to six months in advance for dinner. Six months! So you have to book early if you want to have any shot at eating here in the evening. Lunch is a different story, as they offer walk-up service, but you may still find yourself in for a lengthy wait if you don’t arrive early. 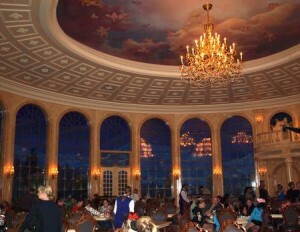 Set in the Beast’s Castle, the themed restaurant features three gorgeous dining areas inspired by the animated classic, Beauty and the Beast. The fare is French-bistro inspired (lamb, steak, chicken, salmon and pork) and runs $18-33 for dinner and $9-14 for lunches which include a selection of salads and sandwiches. 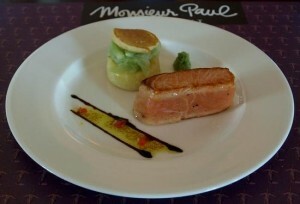 Named for famous French chef Paul Bocuse, Monsier Paul is easily Disney’s most expensive in-park restaurant. Entrees range from $40-50, while three-course dinners can run around $90. Some would call that price tag justified though, as restaurant goers can enjoy steak, fish, chicken, duck, lamb and signature dishes like Soupe aux truffles V.G.E., a delicious specialty soup named for former French President Valery Giscard d’Estaing. A children’s menu is also available with prices starting around $12. 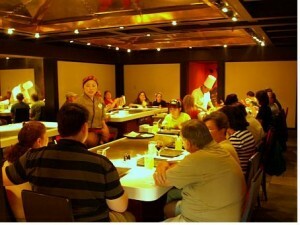 A Japanese style restaurant offering hibachi style cooking and a variety of chicken, steak, shrimp and scallop combinations, this eatery is one Disney’s most popular. Sushi and appetizers are also available, and prices range from around $18 to $32 for their succulent filet mignon. If not for the delicious food, this restaurant would be on our list for its impressive interior design. Located inside a beautifully styled cavern on the shore of the park’s lagoon, Mythos serves up salads, steaks, burgers, fish, pasta and more on its menu that shifts with the seasons. It can be packed from time to time, so we recommend reservations, but prices are moderately affordable at $10-20. Have you been to any of the restaurants on our list? Are there any theme park restaurants you would recommend?